PROVIDENCE – About 35 percent of children in Rhode Island are obese or overweight, according to a new report from Rhode Island Kids Count. The report, released Friday, reflects the findings of a two-year collaboration with the R.I. Department of Health Center’s Health Data and Analysis, the Hassenfeld Child Health Innovation Institute, the State Innovation Model and three health insurance plans. From 2016-2018, the agencies collected information on child obesity statewide, analyzing findings alongside ethnicity and race, age, gender and health insurance status. “The breakdowns are really what’s exciting here,” Devan Quinn, policy analyst at Rhode Island Kids Count said. The independent nonprofit hopes that categorizing the information will make it easier for state policymakers, schools and other groups to create better polices and programs, she said. The study found that 20 percent of Rhode Island’s children age 2 to 17 are obese, and 15 percent are overweight and considered at risk for obesity. While 62 percent of kids are considered at normal weight, the study’s findings are still concerning, Quinn said. “We’re talking about over a third of our children who have a health concern that is impacting their short- and long-term health,” she said. Obesity in kids can cause a host of health problems, including type 2 diabetes, heart disease, asthma, joint problems, as well as causing emotional and academic issues, Quinn added. The highest numbers of overweight or obese kids, at 40 percent or higher, live in Little Compton, Providence, Central Falls and Pawtucket, the report shows. Those areas are followed by Charlestown, Middletown, East Providence and Woonsocket, all of which have a 36 to 40 percent rate of overweight or obese children. North Kingstown, Jamestown, Barrington, Exeter, East Greenwich, Scituate, Glocester and Smithfield are the leanest towns, where 20 to 25 percent of kids are considered overweight or obese. 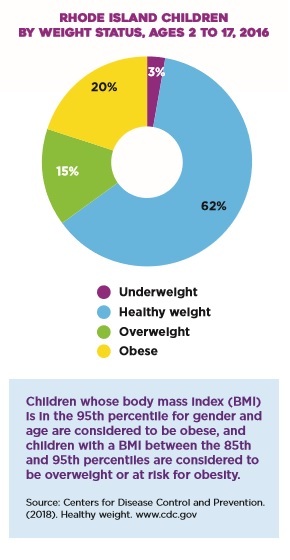 Kids who weigh in at the 95th percentile for their age and gender are considered obese, while those between the 85th and 95th percentile are overweight and at risk for obesity, according to guidelines from the Center for Disease Control. Analysts found that Rhode Island kids covered under public health insurance tend to be heavier, with 26 percent considered obese or overweight, as opposed to 14 percent of children with private health insurance. Numbers also show that 45 percent of Hispanic and 37 percent of black children are obese or overweight statewide. About 36 percent of boys are overweight or obese, compared with 35 percent of girls, the study shows.